Some draws feel like defeats, while others can feel like a win. It was definitely the latter on Tuesday, as we came from behind to grab a draw with Hexham House in the Nines and maintain our points lead over them in the table. The pairs got off to a bad start, and ended up taking the sort of defeat they have been handing to others lately. Down 1-17 after ten ends they did make it more respectable by coming back to 8-24, but the result was never in doubt. There was plenty of doubt about the other rinks, however, with each of them behind at various points. The fours were ahead early on, then found themselves 10-15 down around the half-way mark. From here it was a struggle, but they narrowed the gap to one with a couple of ends to go, and finished up winning 19-18 – the first rink to actually finish and providing a boost for the triples, who still had two to play. The triples had struggled early on, losing the first five ends but at least holding the score to 0-5. Then, with a six to help, they were ahead after ten and fifteen ends before losing two ends and going into the last end three down. An adventurous bowl by Brian Norman gave the others something to aim for and with the last bowl of the night we secured the three shots which drew that rink and the whole match. Considering the triples won only seven of the 18 ends it was a bit of a smash-and-grab raid, but as we all know these things happen. Several of the ladies were in action again the next day, with Jean and Betty getting to the final of the County over-55’s by virtue of a great win over Norma Craig and Pat Brown at Burradon. Ever eager to get on the green, Jean promptly turned out for the West Tyne match at Haltwhistle in the evening. Somehow the threatened rain got no worse than a light drizzle all evening, and we got away not only with the weather but also with a really good result – a win, a loss and two drawn rinks. The two draws were a bit careless, as one came from a three given away on the last end, while the other came after dropping a five on the penultimate end. Nevertheless, you would always settle for a 5-2 points win at Haltwhistle, and David Ashworth’s 27-8 defeat of David Lee’s rink is bound to be one of the stand-out results of the season. It’s not all good news. Jean and Trevor were knocked out in the quarter-finals of the County Mixed Pairs, well beaten by Liz Emerson and David Crozier of Ponteland. Losing ten shots on the bounce to go 3-16 down was a bad start but it still left plenty of time, and with nine shots of our own it came back to 12-16, then 14-17. Even with two ends to go it was just 18-22, but a good end for the Ponteland pair effectively sealed the deal and the last end was played in the vain hope of trying to burn it simply in order to earn another chance to score a seven! What was that about extreme optimism? Next week (beginning 29 June) there will be no competitive matches: not only do the ladies have a bye, but a number of the men are away with the Gosforth Tourists, so that the Nines and West Tyne games have been postponed. The next match reports will be in two weeks, on or around 11 July. This entry was posted in Bowls and tagged Haltwhistle, Hexham House on June 25, 2015 by Fields. Wednesday 10 June may have been just about the best day of the year so far for weather, but it certainly didn’t have matching success on the green. 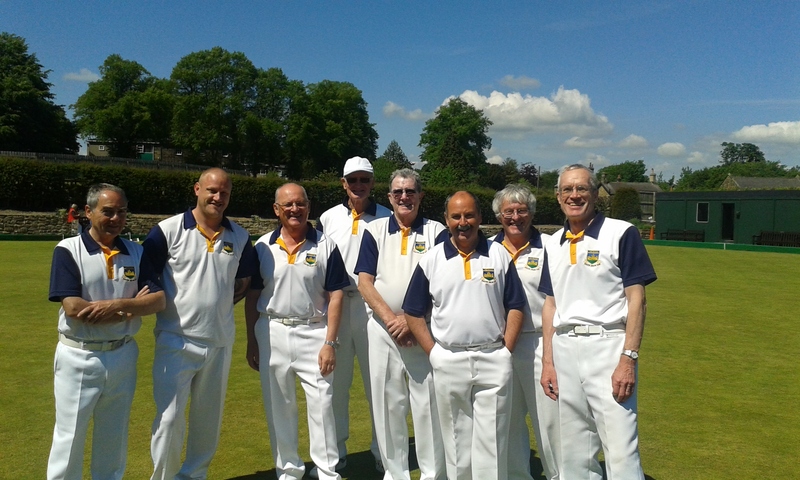 At least the men looked the part for the Bell Cup, held at Alnwick, but the smiles in the photo reflected our only win of the day, before lunch. After that it was all downhill, and for yet another year we finished bottom of the pile on qualifying day. We really must do better next time. Four games of 11 elevens for each of the two rinks, and although we weren’t outclassed in the various games there were too many big scores against us, and in this round robin format that’s fatal. But the weather and the food were great, so as Ken said, if you leave aside the bowls, getting two out of three wasn’t bad. The ladies were meanwhile at Bedlington Dr Pit in the Collins and Shipley, and even if they had got two rinks out of three they might not have won the points, since one rink went down 7-26. The other two rinks finished one shot up and one shot down, showing that the ladies aren’t out of their depth in this league, but such a heavy defeat is almost bound to sink the ship. It was another 2-10 defeat overall, but in fairness that was against the team who were in second position, so depending on other results it needn’t be seen as a great setback. The previous night the Nines nine had gone to Heaton Victoria sitting top of the table but knowing that the Heaton team always give us a very close game. On a lovely evening it was nice to see club shirts still visible during the second half of the game rather than being submerged in thick layers. The playing surface was flat and green, but in other terms it was a disappointment, with straight runs on all the rinks. More than one of our players could be heard complaining that this was more like skittles than bowls. It didn’t matter how much bias your bowls normally took, on these rinks one hand would be uniformly straight, and once there were a couple of bricks in the wall in front of the jack the only way to shift things was with a direct hit. The fours found the way to deal with it early on, and after a couple of big scores were home and hosed by about the tenth end – the final margin was 23-12. The pairs also won, albeit much more closely and with a chance that it might all go wrong on the last end if the Heaton skip had made the right connection; 13-9 showed how close the game was. The triples really struggled, never once in the lead and watching end after end disappear with ones or twos, so that the final score of 8-19 was disappointing but not unfair. Anyway, apart from the minor detail of a 44-40 win on shots, that meant a 6-2 win on points, consolidating top position after a tricky night out. This entry was posted in Bowls and tagged Allen Valley, Bell Cup on June 13, 2015 by Fields. After last week’s successes there was almost bound to be a return to mixed results, and so it proved. The closest league match of the week was certainly the West Tyne game against Hexham House. Both teams were missing a few players, but the overall standard was still very good, and it made quite a difference playing on a calm, sunny evening. One rink finished one shot up to Hexham House, one finished one up to us, and a third was drawn, so things there could hardly be closer; unfortunately one of our rinks lost by nine shots and of course that was the overall margin, with Hexham House getting the shots bonus. On our winning rink Darren saved a point on the final end, drawing second shot to ensure the one-shot win, and not even risking his final bowl. In the Collins and Shipley league the ladies had a difficult day on a very heavy green at Whitley & Monkseaton. It was apparently quite an effort to get bowls up to full length, and a real struggle, with only one rink winning and a long trip home after a 2-10 defeat. There was no such problem with heavy greens at Gosforth when Trevor and Jean played their Mixed Pairs game against a Gosforth team. The bowls were, as they say, flyin’, especially in the direction where they were wind-assisted on one of the windiest June days on record. This didn’t make for very accurate bowling, but both sides were equally disadvantaged, and it was a close match throughout – for example, just 8-7 to the home team after 12 ends. We then moved ahead 13-8, but back they came to within a single shot, and it was only on the twentieth end that a four put us in a comfortable position, seven up with one end to play. Even by the end of the week the wind was still blowing strong, causing mild havoc at the Challenge Cup competition at Cowpen and Crofton. This time it was a cross-wind, which made things difficult in both directions – in fact, this was the biggest challenge of the day. Hats and bits of foliage were blown across the green from time to time, and the scoreboard cards had to be tied with thick elastic bands, or otherwise they were flicking over like the old-fashioned departure boards at airports. Anyway, there were just four clubs in the pool, so it turned into a round robin of three matches of 15 ends, with each club having two rinks. So each club played two games against the other three, with results based on the aggregate scores over the two “legs”. Against the home team our “B” rink lost by three, but the “A” rink won by four; and against Tynemouth the “B” rink’s four-shot defeat was matched by a five-shot win for the “A” group – so both matches were the narrowest of wins. Against Haltwhistle, however, our luck (or rather, our skill) ran out, and both rinks lost, quite deservedly and with no room for debate. Good luck to Haltwhistle in the final. This entry was posted in Uncategorized and tagged Challenge Cup, Gosforth, Hexham House on June 4, 2015 by Fields.